If I had to pick 10 iconic Japanese watches, Orient Pro Saturation would for sure be part of it, featuring an intelligent and innovative design without breaking your bank account, a modern legend and cult object among dive watch aficionados. 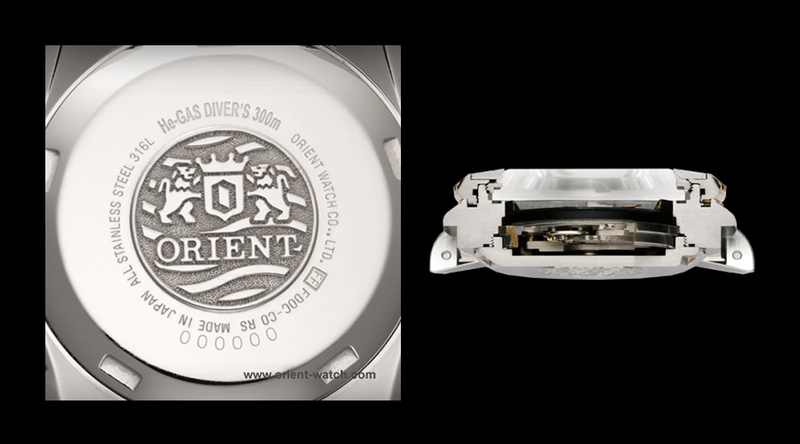 Orient Pro Saturation is one of a kind dive watch; that praises functionality over the superfluous. You easily get the motto by checking its special case, built like a tank that prevents helium gas to penetrate, suppressing the need of a very complex escapement valve, although it’s 300 m deep ISO certified for “saturation” diving. Inside this bulky stainless steel protective shell, its the caliber 40N5A Orient’s own in-house self-winding (made in Japan), that now allows hand-winding and hacking. This caliber has a daily accuracy of 25 sec. to -15 sec, 6 beats per second and a power reserve of 40 hours (slightly more according to some reviews). The dials look vintage nonetheless its readability is just great, the power reserve indicator is placed at one o’clock, the date window placement at nine o’clock which is unusual, among with the massive luminous markers and arms, this dial indubitably has an out of the crowd look. There are a variety of dial colors — red, white and black. Overall quality is superb, the one you would expect in a watch twice the price tag. The $ 2500 price tag of Orient Pro Saturation is a fair price for what you will get, a truly undersea beast, 300 m deep ISO certified. But does anyone go 300 m deep diving? Surely not, unless you are the South African Nuno Gomes who holds the deepest scuba dive world record (without rope stretch) of 318 meters set at 10 June 2005 Dahab, Egypt – Red Sea.